We sustain a small family farm and share its healthy yield with our local and extended community. Every animal is humanely raised with consideration for the environment. We work together as a family in order to closely monitor the highest quality of nutrition, tenderness, and flavor. 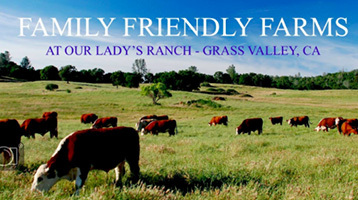 We also eat what we grow so we eat what you eat, and we really enjoy the superior quality of this all natural, grass-fed beef and lamb, pasture raised pork, and free-range chicken.